This property has been upgraded from the last time we stayed and it’s made it even better!! I liked the location. It was a little bit away from the main strip of Puerto del carmen which suited us as we had a car. It would be an inexpensive taxi ride for anyone without a rental. There is a close by shopping area with plenty of restaurants and bars as well this was within walking distance. The complex itself was simple and clean. Mainly middle aged couples. No children at all. The in house cafe/restaurant was good too and run by a very friendly and accommodating gentleman. We had breakfast there most days. The bed was a little hard for my tastes but that's a personal preference. 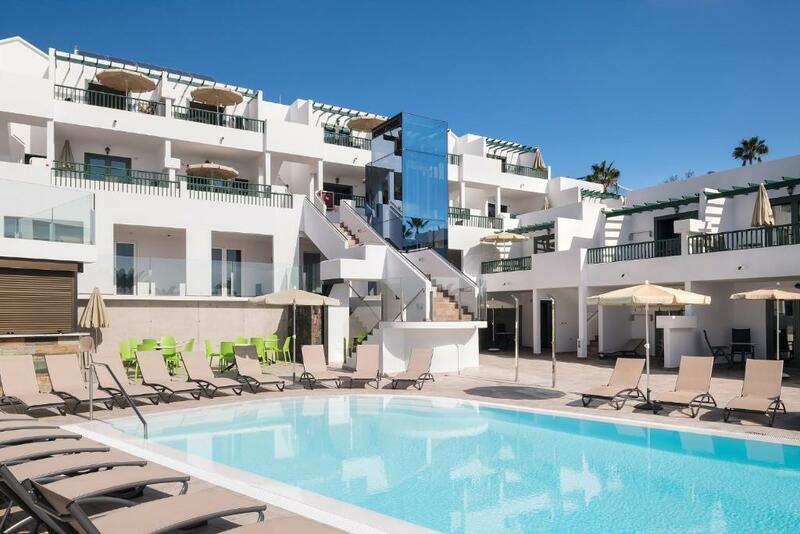 Good sized apartment leading onto large terrace with sea view. Property well maintained. Peaceful - no music blaring. Beach, shops, restaurants within 5-7mins walk. Taxi rank 3min walk. Nice pool area and basic restaurant suitable for breakfast/lunch and snacks. Will definitely stay here again when back in Lanzarote. Well maintained, clean, very nice little bar on the property with balcony view, great for breakfast. Well worth a return visit. A beautiful small apartment with a superb view. Nice private terrace/balcony. Comfy and well laid out. Regular cleaning, fresh towels and weekly bedding change. Very efficiently organised. All the staff very friendly and helpful. We really enjoyed our stay here and felt that we received excellent value for money. Recommended. lovely apartment with beautiful view. Very helpful host, who let us stay in the apartment on the last day, as we had a evening flight, free of charge.. The complex was beautiful. The pool area was lovely and clean. Staff were friendly and the food at the pool bar was brilliant value for money and very nice! 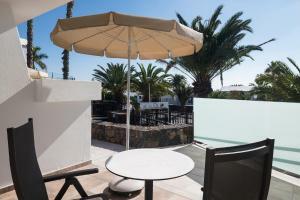 An excellent location in Matagorda with a fine high-level seaview. Nice sitting on the balcony watching the planes come in. Recently refurbished to a very good standard and cleaned/towels and bedding changed regularly. Nice selection of books available to borrow during our stay. The washing up liquid dispenser was also welcome. Lock in a great price for Apartamentos Villa Canaima – rated 9 by recent guests! Apartamentos Villa Canaima This rating is a reflection of how the property compares to the industry standard when it comes to price, facilities and services available. It's based on a self-evaluation by the property. Use this rating to help choose your stay! 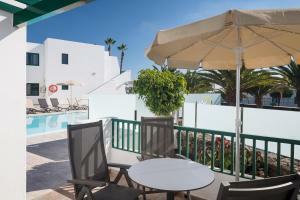 Apartamentos Villa Canaima is 10 minutes’ walk from Matagorda Beach in Lanzarote’s Puerto del Carmen resort. It offers apartments with flat-screen satellite TV, free WiFi, and an outdoor pool with loungers. All apartments at Villa Canaima have central heating and air-conditioning in the bedrooms and come with a balcony or terrace and a kitchenette with a microwave and oven. Apartments can be located on the ground floor or any of the first 3 floors of the building. 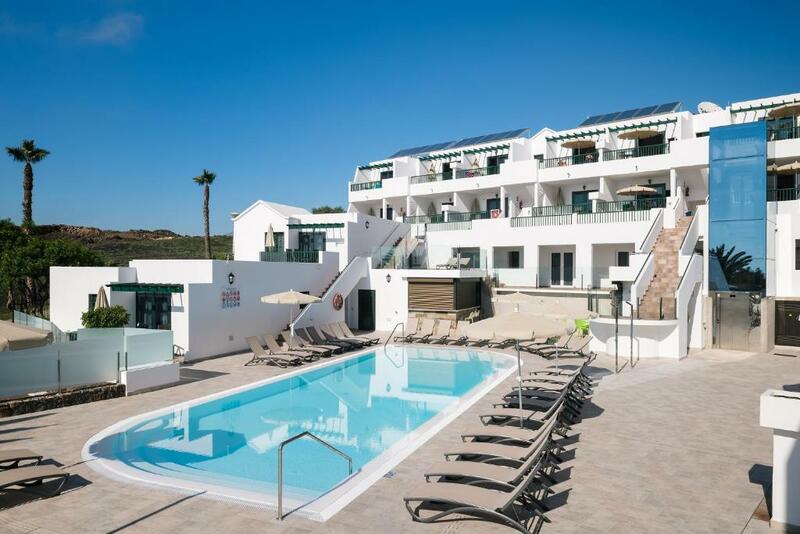 Apartamentos Villa Canaima is 4.3 mi from Lanzarote Golf Course and only 10 minutes’ drive from Lanzarote Airport. Timanfaya National Park is 12 mi away. 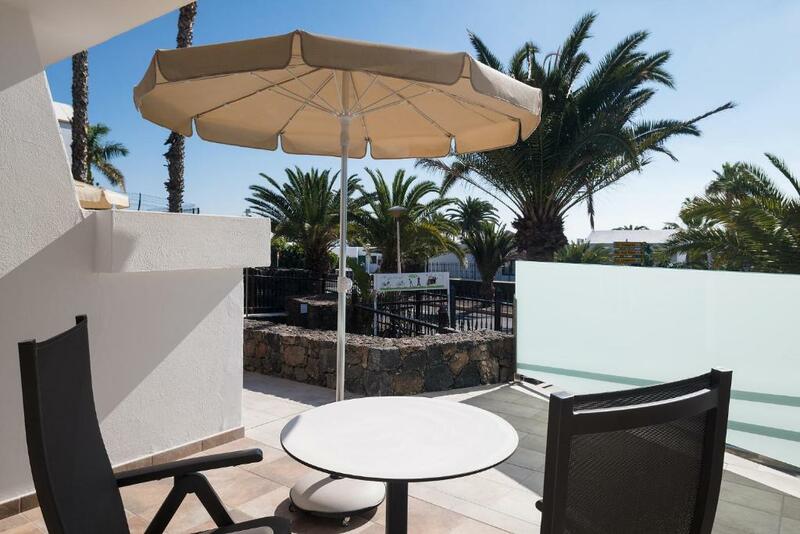 This property is also rated for the best value in Puerto del Carmen! Guests are getting more for their money when compared to other properties in this city. When would you like to stay at Apartamentos Villa Canaima? 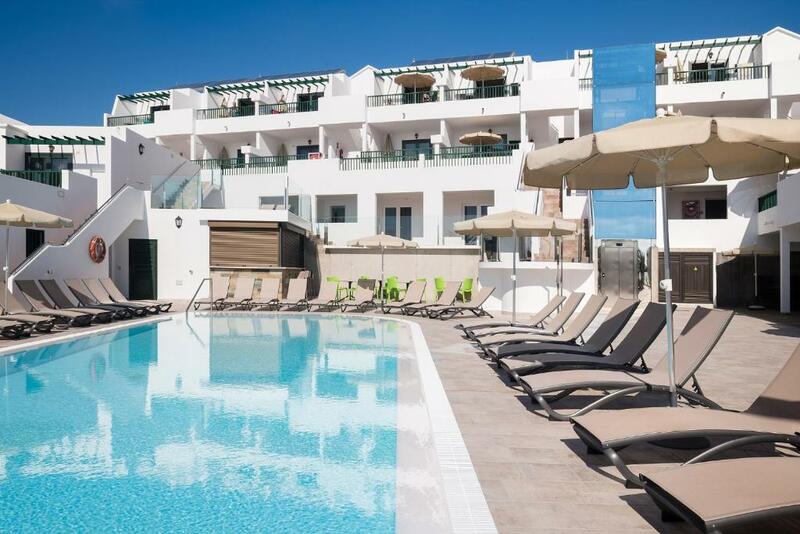 This one-bedroom apartment has a balcony or a ground-floor terrace with views of the swimming pool. It comes with a kitchenette with a microwave and oven, and a lounge area with flat-screen satellite TV. There is air conditioning and heating in the bedroom. 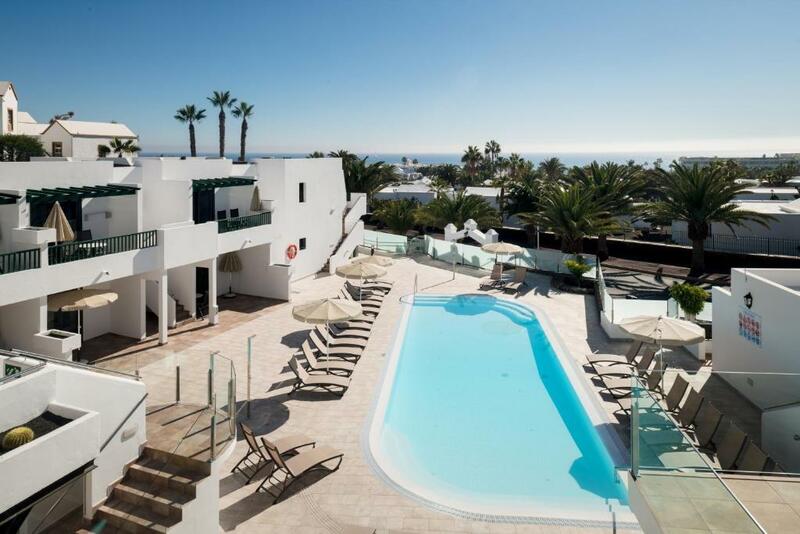 This modern two-bedroom apartment has bright décor and a furnished balcony or terrace with views of the pool or sea. It comes with a kitchenette and a lounge area with flat-screen satellite TV. Located on the second or third floor, this modern one-bedroom apartment has bright décor and a furnished balcony or terrace with views of the sea. It comes with a kitchenette with a microwave and oven, and a lounge area with flat-screen satellite TV. Please note that access to this apartment is via stairs. This one-bedroom apartment has a balcony or a ground-floor terrace with views of the garden. It comes with a kitchenette with a microwave and oven, and a lounge area with flat-screen satellite TV. This apartment features a kitchenette, tile/marble floor and oven. Villa Canaima is a home from home and most people are return visitors. Relaxing, clean, comfortable and quiet. The apartments provide everything needed for a comfortable stay at a very reasonable price. They are well equipped for self-catering. The pool and garden area are kept beautifully clean and well maintained. Our guests have found our staff extremely friendly and really helpful and nothing was too much trouble. 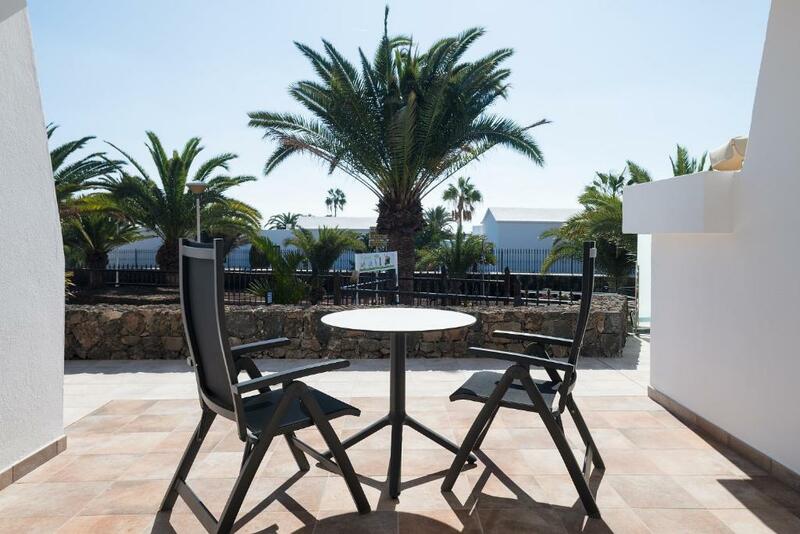 We store your personal stuff, so, any time you find a cheap flight to Lanzarote, you don’t even have to check in a suitcase. We are a family run business. Our parents emigrated from the Canary Islands to Venezuela. Since one of our grandmothers did not want to travel abroad and leave Lanzarote, we often came back to Macher (a Lanzarote village) to visit her during the summer time; this is what kept us in love with the island. In 1990 our father built Villa Canaima, four years later the girls decided to move to the island and we started to manage the complex with the help of a valuable group of people. Matagorda area has a very safe feel to it, which adds to the relaxation our guests felt, and everything you need is an easy walk away. Matagorda beach is one of the most beautiful beaches in Puerto del Carmen. This is a calm beach lined with a pretty promenade and an ample selection of restaurants and shops. It also has a parasol and sunbed service. Go out of Villa Canaima and taxi rank few yards away and bus stops in opposite direction. No need for transfer buses from the airport, just jump in a taxi for 12 euros (airport tax added). Lovely walk on flat promenade from Matagorda to Puerto del Carmen (passing the adjacent Playa Los Pocillos); in the opposite direction from Matagorda, a promenade stroll (longest promenade in the world) takes you past the airport perimeter (where if you are a plane fan they pass overhead extremely close coming in to land) to Playa Honda and for the more adventurous continue to the main capital Arrecife. Bicycle rental availability. 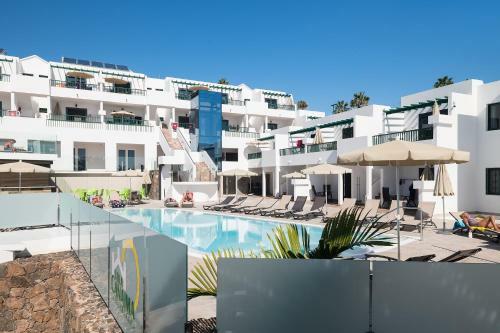 From Matagorda, to the rest of Puerto del Carmen, Arrecife, Playa Blanca and Costa Teguise are all easily accessible via reasonably cheap public transport. House Rules Apartamentos Villa Canaima takes special requests – add in the next step! Apartamentos Villa Canaima accepts these cards and reserves the right to temporarily hold an amount prior to arrival. A bit hard to find, and not very attractive from the outside. The pool was freezing - a shame after an excellent refurb of the complex that heating the pool wasn't included. It would also have been nice to have had the basics such as salt, pepper, sugar sachets etc available. perfect for us .If you like Matagorda as a resort I doubt you could find better for money. Memory foam style bed mattresses sagged during stay & had to turn them over to compensate. Would have appreciated a change of bed linen one week into our stay. Pool could do with being heated during the winter season (it was colder than a 'cold plunge pool" in a health spa!) Position of apartments meant a bit of a walk each evening to get even a half decent meal. Not really my sort of resort being a very built up brash seaside town. Good size apartments, nice bathrooms. Change of towels every other day. Lovely beach not too far away. Great location. Modern clean and comfortable. Friendly helpful staff. The apartments have recently been refurbished to a high standard and were very comfortable however there was a poor finish on the internal doors which left a sharp edge. My 80 year old father cut and badly bruised his arm when he brushed against the edge whilst walking through the door. We reported this three times before action was taken to remove the sharp edges. Although the pool bar had just re opened the salad served was not fresh and the food was a disappointment, hopefully this will improve. Spotlessly clean. All the staff were extremely friendly & helpful. The bottle of water & wine in our apartment on arrival was a kind and thoughtful gesture and much appreciated.